For most pet owners, our four-legged or feathered or finned friends are like part of the family, especially for children, and we look after our pets’ health and well-being with the same care that we would any other family member. And when they pass, which is often sooner than we think, our reaction to their death can be remarkably similar to losing a human friend or relative. However, with people we usually have a funeral or memorial service for them, and often go to a considerable effort to pick the right coffin, or the right urn, and yet pets often just get a backyard burial (if that) with none of those. 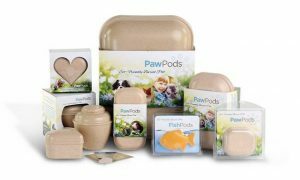 One company is looking to change that, and to do it in an eco-friendly and sustainable way, with its biodegradable burial pods and urns that offer pet lovers an option for creating a dignified and beautiful memorial for their animal friends.